From the editors of the Encyclopedia Britannica comes the thoroughly revised and expanded edition of Britannica's most popular publication worldwide. 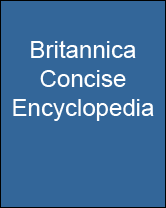 Comprehensive and engaging, the Britannica Concise Encyclopedia contains thousands of articles. The Britannica Concise Encyclopedia has comprehensive coverage on a variety of subjects including, arts, business, geography, history, literature, philosophy, politics, pop culture, science, sports, and more. With an easy-to-use format, pronunciation help, relevant tables, and international maps, this is the reference source that will be used over and over.